It’s not uncommon for many of the residents of a neighborhood not to know one another, much less do anything together. However, what if they’d like to change that? Not through homeowner associations, which focus more on what you can’t do than what you can. Think nonprofit organization – this New Urban News article looks at the Seaside Institute’s New Institutes Program which helps communities establish a nonprofit to do just that. On such community taking action is East Beach, a transformed naval base in Norfolk, Virginia. In this case, the development company took the lead in establishing the community-building nonprofit, stating “You’ve got to find out what turns on your particular residents. There’s not one correct answer to doing this.” Examples of events resulting from the program include house concerts, where “you bring in a regionally known singer – one or two or three of them – and people bring a covered dish,”; steel drum concerts on the beach; a sand castle contest; lecture series; organized water activities, etc. How is this paid for? Homeowner’s association covenants typically assign 1% of the purchase of a home to the nonprofit, and ongoing revenue is raised through events, donations, memberships and sponsorships. For neighborhood commercial districts and downtowns, a is the way to go. 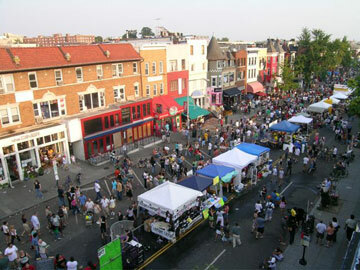 Image: Adams Morgan Day, Washington DC, organized by both a nonprofit and a BID.